A crowdfunding campaign on CrowdPac is raising money from thousands of people to oppose Collins. Whatever Democrat runs against Republican Sen. Susan Collins in Maine in 2020 already has millions of dollars in donations to his or her campaign fund, thanks to Collins’ vote on Supreme Court nominee Brett Kavanaugh. A crowdfunding campaign that hinged on her vote has raised upwards of $3 million for her eventual Democratic opponent when her term is up in 2020. Hosted on crowdfunding site CrowdPac, the campaign experienced such an influx of donors as Collins spoke about her decision to back Kavanaugh on the Senate floor on Wednesday that the website briefly crashed. A parallel crowdfunding effort was launched on progressive campaign fundraising platform ActBlue in the interim. The team behind the campaign calls the trend “rage donating,” Liz Jaff, the president of Be a Hero PAC, told me. Jaff’s group, which was founded by ALS patient and activist Ady Barkan, launched the Collins-related crowdfunding campaign on CrowdPac earlier this year alongside grassroots community action organization Maine People’s Alliance, and the activist and watchdog group Mainers for Accountable Leadership. 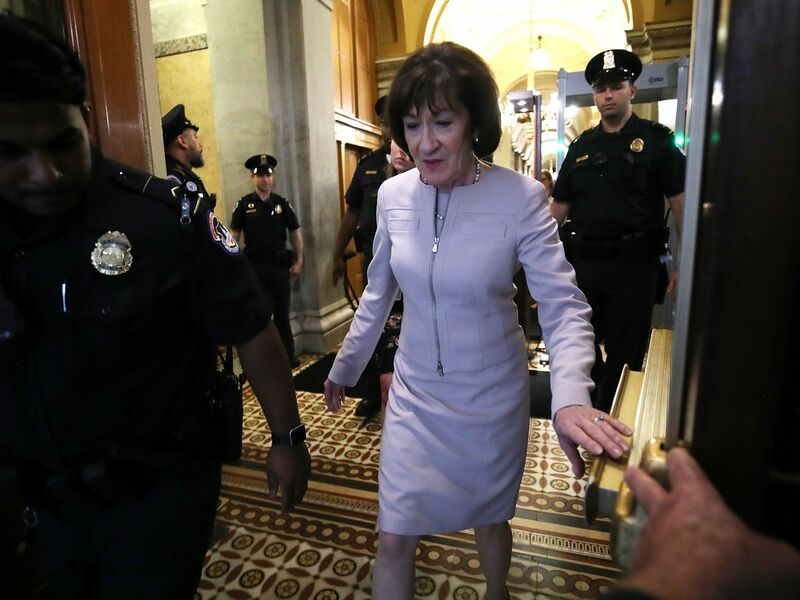 The campaign was meant to encourage Collins to vote against Kavanaugh’s nomination. The proposition was simple: Donors made “pledges” to the crowdfunding campaign. If she voted against Kavanaugh, they wouldn’t be charged. But if she voted for him, the funds raised would go to her Democratic opponent when she is up for reelection in 2020. “If Susan Collins votes to betray millions of Americans and Mainers, we’re going to convert those pledges to donations,” Jaff said. The campaign has been gaining steam for a while — by September, it had raised over $1 million in pledges. And after Collins’ speech Friday, donations soared. Thus far, more than $3.2 million have been pledged. Once Collins cast her vote on Saturday, those pledges became donations to her eventual Democratic opponent. Once that individual is identified in 2020, that money will go straight into his or her account. The campaign’s organizers have set out to raise $4 million, but they’ll take more if they can get it. “If this thing goes up to $6 million, I’m not going to say no,” Jaff said. She told me over 100,000 Americans have donated to the crowdfunding campaign across CrowdPac and ActBlue thus far, and the average donation size is about $25. Once the Maine’s 2020 Senate Democratic nominee is identified, he or she will also get the email addresses of all those who pledged and donated — also valuable assets in politics. Who exactly will be the beneficiary in 2020 of that isn’t clear. Susan Rice, former national security adviser under President Barack Obama, seemed to suggest on Twitter on Friday she might be up for running for the state’s Democratic nomination. “What we are seeing is tens of thousands of people expressing their political speech in a new, powerful, and transparent way, counteracting the dark money that has poured in from big, corporate groups behind the scenes for years,” he said. Opponent pledge campaigns such as these could gain more traction among progressives. Small-dollar donors are eager to jump in on campaigns in 2018, and past November, as they contemplate 2020, this might be an appealing way to do it. ActBlue had donation accounts open for every eventual Democratic nominee challenging a House Republican in 2018, and after the midterms, they’ll set up similar accounts for eventual Democrats challenging incumbent House Republicans in 2020. On the Senate side, they’re even farther ahead: ActBlue already has accounts set up for the eventual Democratic nominees challenging incumbent Republican Senators in 2020. After South Carolina Republican Sen. Lindsey Graham’s angry rant during the Senate Judiciary Committee hearing with Kavanaugh and Palo Alto University professor Christine Blasey Ford, who has accused Kavanaugh of sexual assault, ActBlue tweeted out a link for people to give to whoever winds up running against him when his term ends in 2020.